Steve, is this a blocking event? It seems somewhat persistent, and is there any connection to Debby's slow movement? Yes, this is a classic summer blocking pattern, with a strong high pressure ridge over the central part of the US. 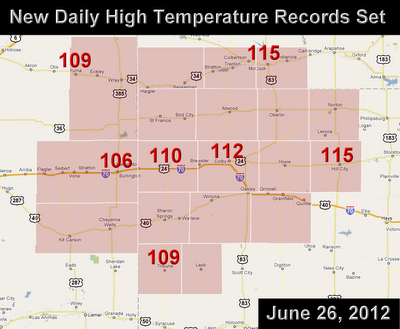 The difference is that this is more intense than average, so extreme temperature records are being set. Debby was trapped between this mid-latitude ridge and a subtropical ridge to the south. For a time, it appeared that the strength of the northern ridge would force Debby westward in the Gulf, but the westerly flow aloft (shear) weakened the storm, and it eventually worked its way eastward.